Hi, everyone! Tonight I have a card I'm entering in a couple different challenges. I must start off and just say that I LOVE that lace! That lace you see to the right of my card is a stamp created by Nina Brackett. It is part of a stamp set called Vintage Backgrounds and it is AWESOME. My favorite kind of card is a vintage one so I'm sure you can see why I love that stamp set so much! It actually pained me a bit to have to "hide" the bottom part of the stamped lace but it looked best with just a bit of it showing. ;0) That print you see in the background is another one of the stamps found in Vintage Backgrounds--isn't it awesome!!! I also used Nina's Lovely Labels set and her Nana's Needlework set. Yes, I am a Nina Brackett fan. ;) The DP is none other than Webster's Pages and the ribbon and card stock (pure luxury in Chocolate Brown) is GinaK. 1. Card Patterns #64: this week the sponsor is none other than GinaK Designs, woo hoo!!! I used their sketch found here. One lucky random winner will get two of GinaK's stamp sets!!! Nice! 2. 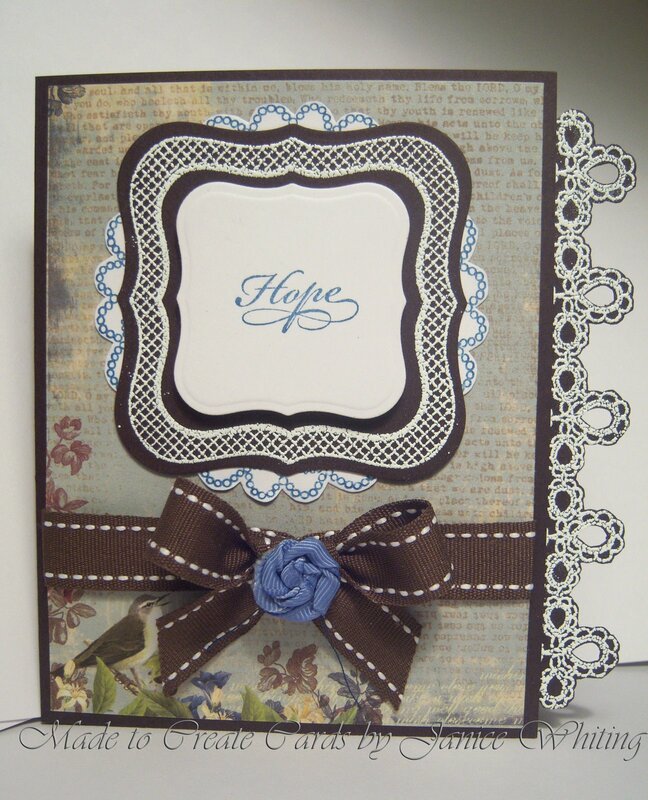 Stampin' Sisters in Christ: their challenge for this past week (#38) was to create a card using the colors brown, blue and white. Beautiful and elegant! Love that edging!Thanks for playing at Card Patterns! Love all of the rich browns. This is gorgeous Janice! I'm loving that lace, too!! Beautiful use of lace stamps. Fab paper too. Oh yes, Nina's designs are gorgeous so as your card! Beautiful! This is sooo pretty, Janice. I love all the tiny details, inc that peeking doily in the back.